Have a Vision That Clarifies Your Purpose? Our vision should not only express our purpose, as suggested in the previous post, but also clarify it. The way we communicate, or cast, vision must lead back to our purpose because our purpose provides the motivation for reaching the vision and for meeting the goals. If we purpose to love God and people, then what we do will be grounded in love. It’s why we do what we do. And, what we do will be guided by love. It’s how we do what we do. Though tempted to come up with catchy phrases, we must make sure people get the connection. People shouldn’t have to guess at who we are, what we’re about, and how we’re going to get there. People should be able to remember why we do what we do (our purpose), what we will do to accomplish our purpose (mission), and how we will get there (vision). Have a Vision that Expresses Your Purpose? Have a Vision Challenging Enough to Reach Your Purpose? No Specific Examples of Goals in the Great Commission? This entry was posted in Goal-Setting & Vision Casting. 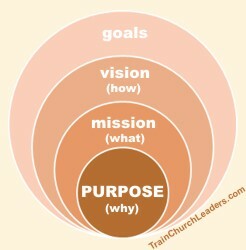 ← Previous Previous post: Have a Vision that Expresses Your Purpose? Next → Next post: Have a Vision Challenging Enough to Reach Your Purpose?